The goal of breast reconstruction is to restore one or both breasts to near normal shape, appearance, symmetry, and size following mastectomy, lumpectomy, or other trauma. Breast reconstruction often involves several procedures performed in stages and can either begin at the time of mastectomy or be delayed until a later date. A reconstructed breast will not have the same sensation or feel as the breast it replaces. Breast reconstruction surgery is typically performed in a hospital setting, may include a short hospital stay, and will likely use general anesthesia. Some follow-up procedures may be performed on an outpatient basis, and local anesthesia with sedation may be used. These decisions will be based on the requirements of your specific procedure and in consideration of your preferences and your doctor’s best judgment. Be sure to ask your plastic surgeon questions. It’s very important to understand all aspects of your breast reconstruction. It’s natural to feel some anxiety, whether it’s excitement for your anticipated new look or a bit of preoperative stress. Don’t be shy about discussing these feelings with your plastic surgeon. Saline implants are filled with sterile salt water. They can be filled with varying amounts of saline which can affect the shape, firmness and feel of the breast. Should the implant shell leak, a saline implant will collapse and the saline will be absorbed and naturally expelled by the body. Saline implants can feel or look wrinkler in thin patients. Silicone implants are filled with an elastic gel. The gel feels and moves much like natural breast tissue. If the implant leaks, the gel may remain within the implant shell, or may escape into the breast implant pocket. A leaking implant filled with silicone gel may not collapse. If you choose these implants, you may need to visit your plastic surgeon regularly to make sure the implants are functioning properly. An ultrasound or MRI screening can assess the condition of breast implants. They are usually filled with a cohesive gel. If they rotate, they may lead to a strange appearance. 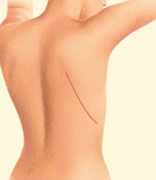 It is also usually necessary to have a longer incision with these implants. Round implants have a tendency to make reconstructed breasts appear fuller than form stable implants. They also often will make the breast project out further away from the body. New high-profile options can lead to even more projection, if that is a concern for you. Because they are the same shape all over, there is less concern about them rotating out of place. Implant manufacturers occasionally introduce new styles and types of implants, so there may be additional options available. Whether you choose saline or silicone implants, it is important for you to monitor your breast implants and follow up with your plastic surgeon for appropriate checkups. The decision to have breast reconstruction is extremely personal. You will have to decide if the benefits will achieve your goals and if the risks and potential complications are acceptable. You will be asked to sign consent forms to ensure that you fully understand the procedure and any risks and potential complications. 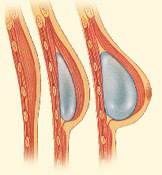 Fat transfer risks include cysts, infection, microcalcification, necrosis (death) of fat cells and the possibility that some of the transferred fat cells will leave the breast area. It is important that you address all of your questions directly with your plastic surgeon. 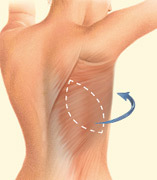 Following your surgery, gauze or bandages will be applied to your incisions. 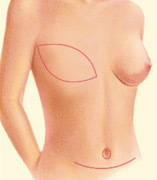 An elastic bandage or support bra will minimize swelling and support the reconstructed breast. A small, thin tube may be temporarily placed under the skin to drain any excess blood or fluid. A pain pump may also be used to reduce the need for narcotics. You will be given specific instructions that may include how to care for your surgical site(s) following surgery, medications to apply or take orally to aid healing and reduce the risk of infection, specific concerns to look for at the surgical site or in your general health, and when to follow up with your plastic surgeon. The results of breast reconstruction will be long-lasting, provided that you maintain a stable weight and general fitness. As your body ages, it is natural to lose some firmness, but most of your improvement should be relatively permanent. 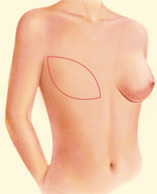 Over time, some breast sensation may return, and scar lines will improve, although they’ll never disappear completely. There are trade-offs, but most women feel these are small compared to the large improvement in their quality of life and the ability to look and feel whole. Careful monitoring of breast health through self-exam, mammography and other diagnostic techniques is essential to your long-term health. Prices for breast reconstruction can vary. A surgeon’s cost may be based on his or her experience, the type of procedure used, and geographic office location.